PERSONALITY PREDICTORS will provide you with a pathway to understanding your inner self and relating to others. This Book is a Guide and the Key to Empowering Yourself and Controlling Your Destiny In the World. There are only 7 Personality Types that are present in all cultures and ethnicities. 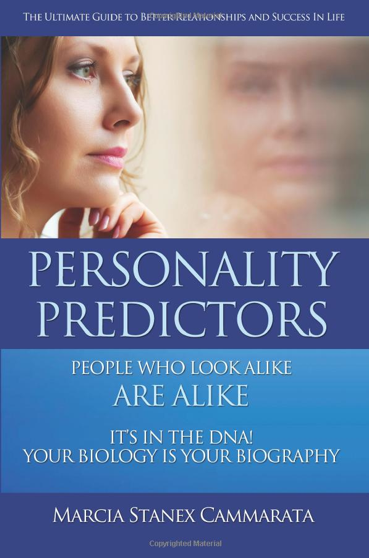 You can quickly learn to analyze anyone’s personality through initial observation and be able to predict an individual’s personality with some degree of confidence after reading this book by studying the patterns that repeat themselves across all humanity. With the assistance of the illustrations and caricatures of each type to guide you, you can master the art of observation. Personality Predictors is an innovative technique and effective method that is more accurate and comprehensive than astrology, horoscopes or body language for determining Personality Types. This system will enable you to learn to identify and predict character traits and temperament by Observation of the combination of body types and facial features. This book provides you with illustrations, photos, caricatures, and easily recognizable current examples of the 7 Personality Types to help identify each of them as well as chapters related to Newsworthy individuals you may know. The Personality Predictor system was derived from the ancient historical study of Physiognomy which evolved over centuries. Genetics determine the structure of your character traits from birth. You are an echo of the generations before you. All human development is determined by nature and our “ancestral record”. Neuroscience and recent studies have reinforced that we are a product of our genetics. It is in our DNA. Open the door to better understanding and discovery of who you are, focusing on your uniqueness so you can govern your life, control your future and achieve success and meet its challenges. It will empower you to observe others and adjust your expectations of relationships to be more tolerant of their differences. The knowledge in this book helps you communicate and interact with friends, identify difficult people and handle them tactfully, negotiate successfully with colleagues in business, know what your future mate is really like,if you are compatible , and assist you to establish harmonious relationships. It will guide you to the career path best suited for your talents. It is the ultimate guide and the key to empowering yourself and controlling your future, enhancing your self esteem and finding the stepping stones to friendship, intimacy, achievement as well as becoming secure in who you are so you can find fulfillment and success in life. You can move forward with confidence, and overcome obstacles, interface with others more successfully once you understand your temperament and the character traits of those you meet in your daily life. You will be able to navigate through the obstacles of life with less stress and develop the power of positivity. You will see humanity more clearly. There is a correlation between behavior styles and personality types established by numerous studies. Personality Predictors is an analysis system that can be learned. This book will provide you with innovative tools and examples to achieve that knowledge. Whether you are simply curious about yourself and your family and friends or in a profession that requires social interaction, you will benefit by being able to predict personality types of individuals by observing their facial and body characteristics. You will have the advantage of knowing what a person is like behind the mask and develop the skills to communicate with them as well as understand their eccentricities, idiosyncrasies and attributes. You can avoid relationship pitfalls and make the best of every situation you encounter.